The lathe is one of the oldest machine tools and came into existence from the early tree lathe which was then a novel device for rotating and machining a piece of work held between two adjacent trees. A rope wound round the work with its one end attached to a flexible branch of a tree and the other end being pulled by a man caused the job to rotate intermittently. Hand tools were used. With its further development a strip of wood called “lath” was used to support the rope and that is how the machine came to be known as “lathe”. This device continued to develop through centuries and in the year 1797 Henry Maudsley, an Englishman, designed the first screw cutting lathe which is the forerunner of the present day high speed, heavy duty production late, a machine tool which has practically given shape to our present day civilization by building machines and industries. 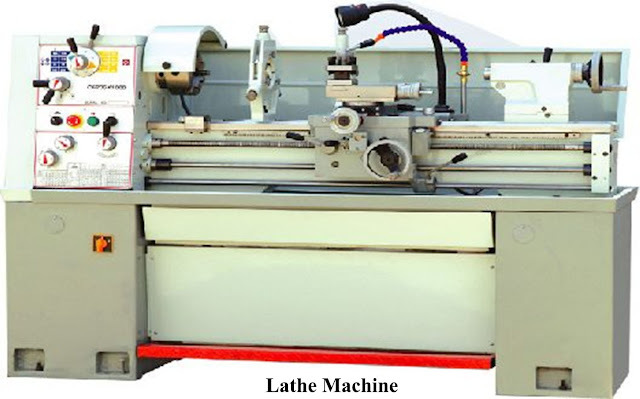 The lathe can be defined as a machine tool which holds the work between two rigid and strong supports, called centres, or in a chuck or face plate while the latter revolves. The chuck or face plate is mounted on the projected end of the machine spindle. The cutting tool is rigidly held and supported in a tool post and is fed against revolving work. While the work revolve about its own axis, the tool is made to move either parallel to or at an inclination with this axis to cut the desired material .In doing so it produces a cylindrical surfaces, if it is fed parallel to the axis, or will produce a tapered surface if it is fed at an inclination of machine spindle. In machining operations on lathes the work piece is rotated and the material in the form of chips is removed with the help of cutting tool, which has a linear feed motion, and it can be fed deep in the job. The tool may be given linear motion in the desired direction. To rotate the work piece two methods are employed. The first is by a belt drive and the second is by the gear drive. (a) Swing of maximum diameter of job, over the bed. (b) Maximum Length of the job that can be held between centres when tail stock is at extreme end of the bed. (c) Bed length which may include the headstock length also. (d) Type of headstock, geared or cone pulley type.